This is an ancient locational and aristocratic surname which derives from a number of places thus called in northern England. 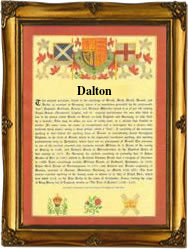 This could be Dalton in Durham, Lancashire, Yorkshire, Westmoreland and Northumberland. 'Dalton' derives from the Olde English pre 7th Century "doel" - a "valley" or "dale" and "tun" - a farm or settlement, and was originally given to those who like the examples below, held lands at such a place. (The place name is chiefly found in hilly districts). In the modern idiom the name has at least four spelling variations including Dalton, Daulton, Daughton and Dawton, although all have exactly the same meaning, the spellings being differenced by local dialects. Early examples of the name recording include William de Dalton of Northumberland in 1273, Richard de Dalton of London in 1293, and Johannes de Dalton of Yorkshire in the 1379 poll tax rolls. At the famous battle of Boroughbridge in 1322 and at the siege of Calais, France in 1345, 'Sire Robert de Dalton', believed to be a Yorkshire knight, bore a coat of arms with the blazon - blue, crusily gold, a lion rampant gardant in silver. These are ancient arms which predate the establishment of the College of Arms in London. The first recorded spelling of the family name is shown to be that of Henry de Dalton, which was dated 1273, in the "Hundred Rolls of Northumberland", during the reign of King Edward 1, known as "The Hammer of the Scots", 1272 - 1307. Surnames became necessary when governments introduced personal taxation. In England this was known as Poll Tax. Throughout the centuries, surnames in every country have continued to "develop" often leading to astonishing variants of the original spelling.